(Greg Fiume / Getty Images) Clay Buchholz (61) is taken out of the game by manager Terry Francona (right) in the third inning. BALTIMORE - Even he knew, as he walked off the mound, as he walked out of the major leagues (for now), what his fate would be. There was little else to do, little leeway, on a team for which every win is precious. Clay Buchholz could have looked at the scoreboard and seen the three runs already in on his watch, with two more soon to follow, and realized that all this - the big league parks and the pressure of a season nearing its end - would no longer be his. Not long after the Red Sox finished up an 11-6 loss to the Orioles last night in front of 33,364, a game so bad that infielder Alex Cora warmed up in the bullpen, Buchholz was called in to talk to manager Terry Francona. He would be sent down - not to Triple A - to Double A. There a pitching coach waits, one who - the organization hopes - can straighten out a pitcher who seems to have no answers this season. "That's not good, [with] your expecta tions, to say, 'Yeah, I think I'm going to get sent down,' after each start," Buchholz said. "But the last couple starts, it's hard to think they can give me any more opportunities than they have in this stretch, especially with only a month and a half left in the season and the pennant race as close as it is now. "You've got to send guys out there that . . . you believe they're going to go out there and give you a win or give you six, seven innings, and I haven't been doing that. So I hate to say it was the right decision, but I believe it was." 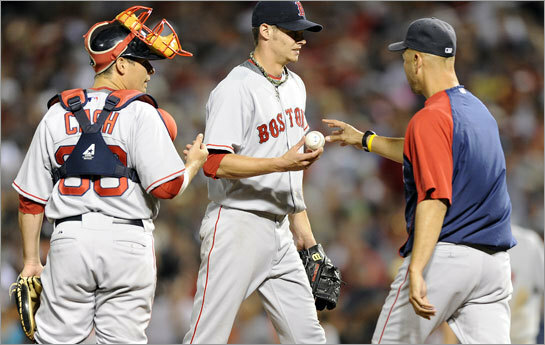 Buchholz will head to Portland after his seventh loss in his last nine outings. He will work with Sea Dogs pitching coach Mike Cather, who has tutored Buchholz at Single A Wilmington and Double A Portland. Cather, more than anyone else in the organization, knows Buchholz's stuff, and what it might take for him to return to being the pitcher he was last year, the pitcher he's been throughout his young career. It was, as Francona said, "pretty obvious we needed to do something." "I think we felt like we need to give him a little bit of a renewed start," Francona said. "Because it's obviously not working right now. I think we all believe strongly that it will work, but at the moment, it's difficult." The Red Sox cannot afford to have an automatic loss every fifth day, with the Rays ahead in the AL East standings by 4 1/2 games, and the White Sox and Twins strong wild-card contenders. The Red Sox are 70-42 without Buchholz. Behind the rookie, they are 3-12. Nothing worked last night, as the four-run lead handed to Buchholz - his third straight first-inning lead in three straight Sox losses - dissipated in just two innings. But it was more than that. There were poor decisions, such as a 3-and-1 pitch to Luke Scott in the second when Buchholz shook off Kevin Cash to throw a changeup that didn't work out. "To me, you're putting a lot of pressure on yourself," Cash said. "With the game the way it was, we had a lead, we kind of had the upper hand on them. You don't want to give them any opportunities, and I think that kind of opened the door a little bit." Pulled after 2 1/3 innings, with two on, Buchholz could only sit in the visitors' dugout and watch the further destruction of his ERA and his confidence, and the one-run lead the Red Sox held. David Aardsma relieved Buchholz, with Melvin Mora (hit by a pitch) and Scott (walk) on base. After two balls, Ramon Hernandez blasted a shot to center field, taking a further chunk out of the legend of Buchholz, forged when he no-hit the Orioles in his second major league start. And, for that matter, taking Coco Crisp out of the ballpark. Crisp climbed the wall as the ball came hurtling toward him. He almost got it, too, tumbling over the fence as the ball stayed perhaps 6 inches out of his grasp. That meant six runs for the Orioles, five allowed by Buchholz, as his ERA ballooned to 9.22 over his last eight starts. "Buch's got good stuff," Cash said. "He's got as good stuff as anybody on this team. When he realizes that, and believes in that, he's going to be back and big for us." Even after Buchholz left the game, the bleeding didn't stop. Not only did Aardsma allow that Hernandez homer, he gave up another run to close out the third. Javier Lopez followed by allowing three more in the fourth, and Mike Timlin allowed a run in the fifth. Given Daisuke Matsuzaka's early exit the night before, when he lasted just five innings, the bullpen was already taxed. And last night was even worse. With only Justin Masterson, who pitched Tuesday, and Jonathan Papelbon as options in the bullpen, Francona left Hideki Okajima in for two innings, the seventh and eighth. Cora was warming, but with the Sox scoring a run in the eighth, Francona said he didn't want to give up on the game. So he didn't, at least in terms of his bullpen. "You feel an obligation certainly never to hurt anybody, but also you see guys jumping over the fence trying to make plays," Francona said. "They didn't quit playing." But there was little they could do in the end. Buchholz put the team in yet another hole with yet another bad outing. And, finally, there was no more room left for the pitcher to develop at the major league level. Something had to give. "You're down there to develop and everybody knows that," Buchholz said of pitching in the minors. "Up here you're in a pennant race. I've never been one to say that pressure was too much for me, but I've felt like I've had a lot of weight on my shoulders, just trying to be perfect, trying to do everything as well as I could to help this team win, and it hasn't been near good enough. "The decision was coming. It had to be made soon. They had given me ample opportunity to help this team and to help myself out up here, and it just hasn't worked out."